Christmas is in 6 days!!! So, about this outfit. Even if you’re more of a casual dresser for Christmas, an outfit like this is perfect for New Year’s Eve, too. 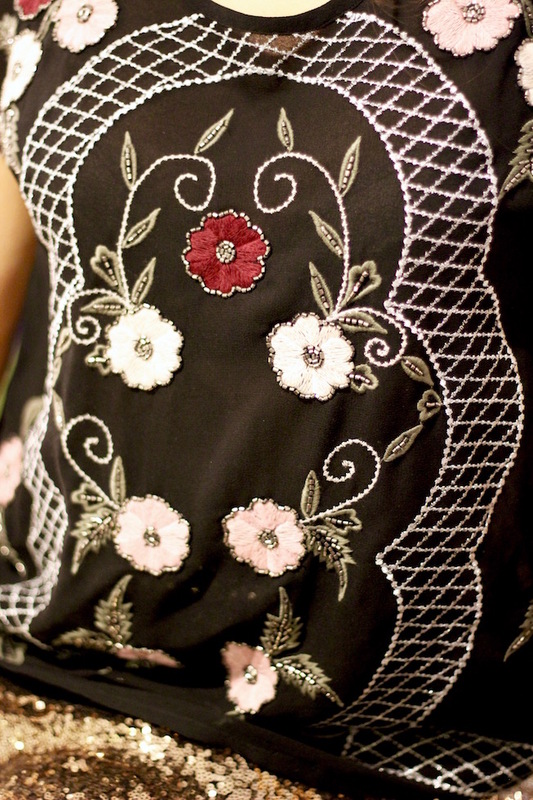 When I bought this top I never thought I’d pair it with something that had more beading, but after debating whether to be boring and put it with black jeans (typical me) I thought it just needed something more to do it justice. I found this skirt in Target and it just has the perfect shape for a loose top because it’s a little fitted on top, like a peplum style, so the bottom just flares out from underneath and it’s just a cute look. 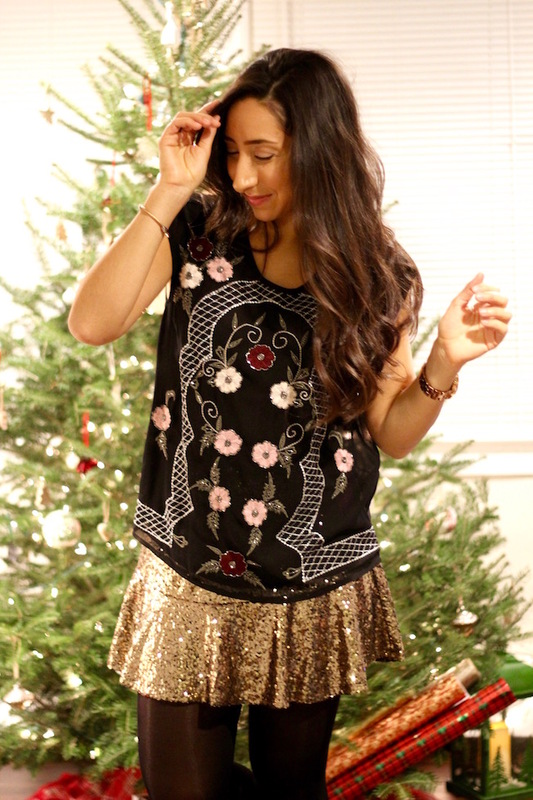 I think the gold sequins actually makes the shirt pop that much more, too! The shirt is also a little see-though on the bottom and in the back but I think that’s so cute if you’re wearing maybe like a black bralette underneath, plus the the top of the skirt kind of shines through the shirt and it’s so pretty. And both my top and skirt were so affordable! 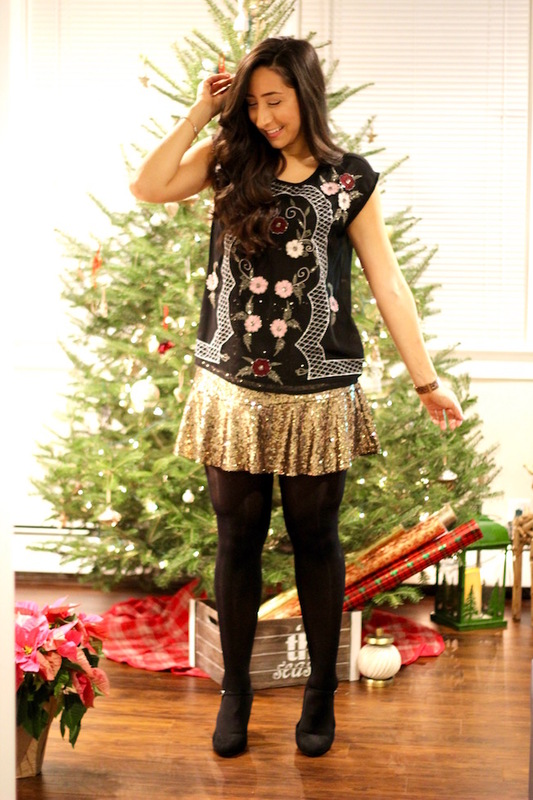 You can even just wear this skirt under a casual sweater and it’ll peak out from below for that little pop of sparkle. So comfy and so cute!!! I paired it all with black tights and these adorable mary-jane style pumps because I thought it made all look a little more wintery. Plus my shoes were on sale for only $29 and they are SO comfortable 😄 I walked around in them for a while the other day and I have no complaints. 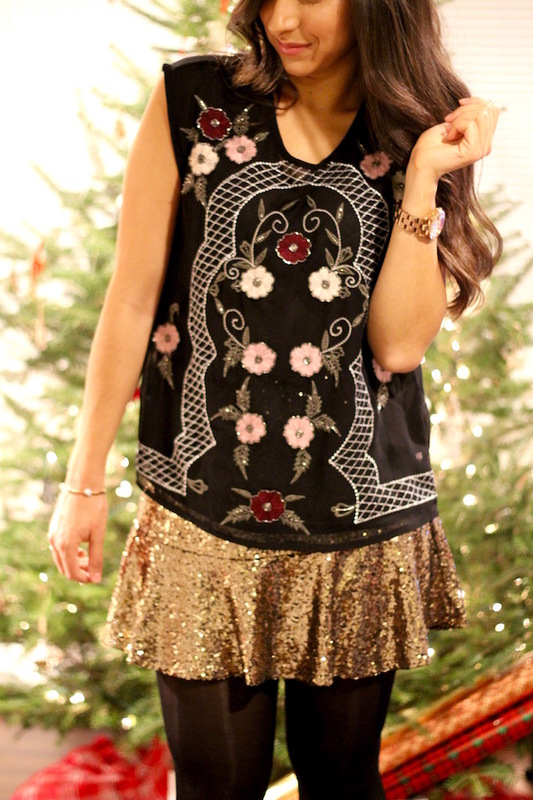 The embroidery on your Guess top is beautiful, and I LOVE that sequin skirt! Your outfit is very pretty, you look fabulous wearing it, and you have a beautiful smile! I hope you have a very merry Christmas and a very happy year 2017!